SIPS are lightweight composite panels, the internal and external cladding are bonded to the insulated core to create a thermally efficient and robust envelope to the home. We’ve developed this system so you now have finish options for your home, both internally and externally. SIPS permit rapidly installation, replacing several traditional elements of: Framing, cladding, lining and insulation. When combined with improved performance the benefits are obvious and remarkable. SIPS aren't new, having being utilised for decades thoughtout Europe and North America to tackle cold environments. Only recently has the system been adopted to exploit its beneficial properties and newly available building materials to tackle our variable and harsh climatic conditions. Now with the use of “infinite element engineering analysis” the system is being utilised here to create envelopes that are both structurally sound and efficient in protecting against our extreme climate. Over the past few years, modular home systems similar to those of North American have emerged in Southern hemisphere. Until now there has been no deviation to utilise our available facing materials. SipForm gives you a host of finishes to ensure you aren’t limited in choice. Now with these multiple options for external cladding and internal lining, and the variants available through those suppliers, Architects and owners can finish their creations to complement their shared vision. Simplicity in construction is at the core of your SipForm home. Speed, strength and efficiency is what sets it apart from common, yet far less efficient traditional methods. SIPS utilise the rigidity of the bonded, precision engineered panel in combination with the high tensile jointing to create an extremely robust envelope to the home. Expanded Polystyrene is a light weight closed cell synthetic with remarkable insulating properties and high structural integrity. EPS is widely used in the building industry for these physical properties and resistance to pests. Combining this rigid insulation material with the structural properties of the cladding results in a light weight high performance panel with incredible integrity. Its obvious we are making global shift toward more affordable, efficient and environmentally responsible living. The old ideology of the brick & tile home is being traded for a truly Architectural aesthetic and better performance. SipForm suits this emergent light weight, low impact aesthetic. Homes utilising this method prove to be of higher efficiency whilst remaining truly affordable. Through research, development and testing by our Engineering partners, coupled with our aim to utilise the new range of local products, means SipForm is proving to be at the cutting edge of this emergent and efficient construction revolution. The demand for fast and affordable methods, better suited to this emergent style, gives us greater appreciation of such technologies in new home construction..
Let’s look at why SIPS work! So let’s look at just why SipForm panels perform so well in controlling internal temperatures and makes for the ultimate silent space inside your new home. It turns out that the Expanded Polystyrene core is the wonder material of this century! Its low density makes it exactly the style of material we are looking for in handling both temperature and noise transfers. In fact, it is when we get to doors and windows where elements cross both faces of the panel that these benefits are reduced. Using this wonder material for the core of each panel makes for the internal temperature of the home to be much more stable, while using far less energy to control the level of comfort. When using our Super Graphite core material you can achieve an extra full R value to your home’s external envelope. Graphite reduces the amount of radiant heat that moves through the EPS. 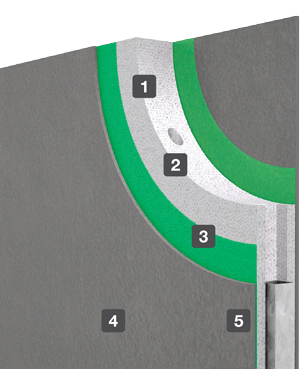 The result is that it can cut the heat transfer through the outer walls by up to 30%. In two storey homes or second floor additions, structure may dictate the use of a conventional flooring system. SipForm floor panels can be utilised to achieve greater clear spans and reduce the flooring depth, or SipForm Quiet floor panels can be installed over any floor joist structure. Both options improve insulation between climate controlled zones providing greater internal comfort and reduction in energy costs, better acoustics and more privacy throughout the home.